Play 21 Blitz at Gembly - Excitingly fun! 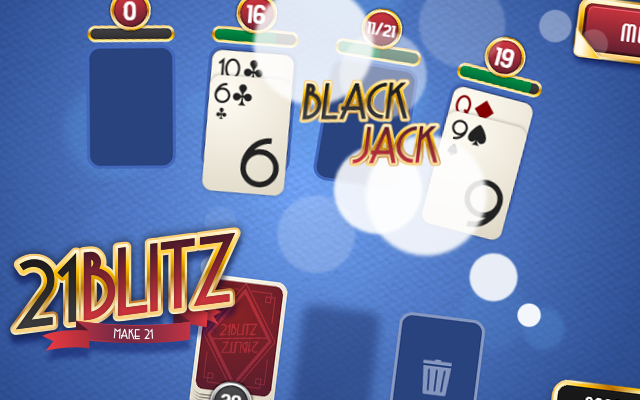 21 Blitz is a strategic card game which shares some of the rules of Black Jack. But unlike in the slow paced Black Jack the goal is to add up the cards to 21 as quickly as possible in the 4 available slots whilst having to complete 2 decks of cards. Think carefully about the cards you use and the cards you trash, before you know it you will find yourself running out of options. It seems like a simple task but can you think ahead and remember which cards have already been played? Combine the cards in each slot to 21. 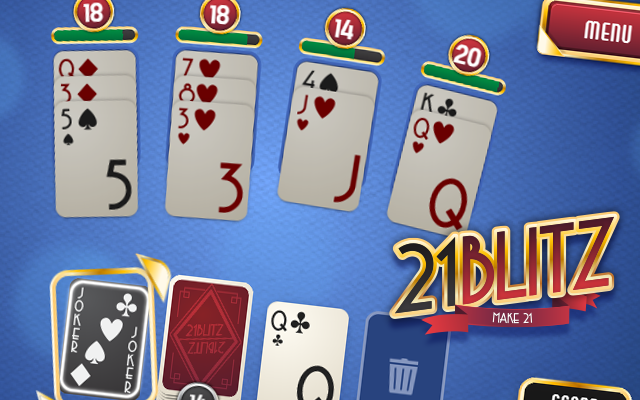 Get more points by making 21 with just 2 cards (Black Jack) or get 21 Blitz by combining 5 cards to 21! The sum of each slot is not allowed to exceed 21. If all slots are full and you cannot place the drawn card anywhere you then have to discard this card or use the joker instead. You get one Joker per deck to play. The joker combines any slot to 21! Use it to get rid of the hard stacks or when you are stuck. 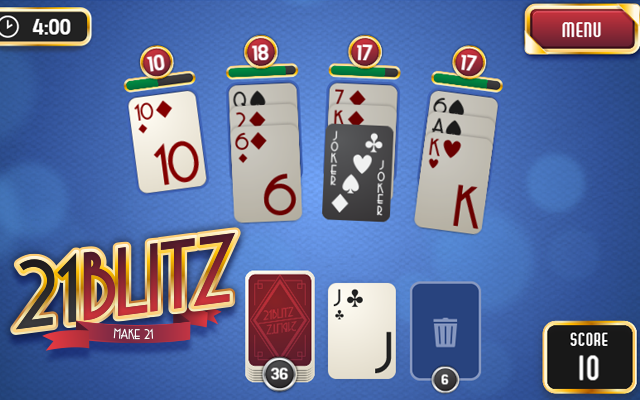 In 21 Blitz you make stacks of cards on the fields to make 21! You can make 21 by placing, for example, an ace and a 10 (or a card with the value of 10) which is called Black Jack and awards more points. You can also make 21 with multiple cards, so for example with a 2, 4, 5 and a Queen. Each slot is not allowed to exceed 21. So if all the slots are full and you cannot place your card you will have to discard it or use the joker. You have two decks to play trough, and the game ends when both decks have been played or the time has run out. For every combination of 21 you make you get 10 points times the number of 21's you have made in each deck. So, the first combination of 21 you make will award you 10 points, the second 21 will award you 20 points (10x2), the third 21 will award you 30 points (10x3), and so on. Making Black Jack, 21 with just 2 cards, will multiply the score you receive for the 21 by 2. Making 21 by using 5 cards will multiply the score you receive for the 21 by 3.